I purchased these horns but the only way they fit behind the fairing is with the opening facing forward. They lasted thru the first rain storm. What are you guys using and where did you mount them? I am thinking about mounting a waterproof pair on Buck's Light Bar bracket. For now, I am going to mount these horns on the brake portioning valve. I converted to the 2 line system, so it's not used. As long as I don't take any jumps, I don't think the forks will slide far enough that the outer would hit the horns. I have a set of FIAMM Freeway Blasters, which I think are smaller than those. I made some braket to mount them under the ends of the instrument panel inside the fairing. That isn't the best location because the fairing blasts the sound right back in my face. Also makes it tough to add wiring and other accessories in there. But they wouldn't fit in the stock horn locations, either, so what are you gonna do? I am going to leave them under the brake valve for now. If I get tired of the look I will try something else. Haven't ridden the bike since putting them there, still have it torn apart for other work. Was talking with the now Famous Fais at the Nats. about horns and he told me about the horns on the 2016 H-D Sportsters. Claimed as loud or louder than his Piaa setup and only like $40. That's next on my list and actually the only thing left I could possibly have room for. The horn is from the 2016 Sportster 1200. I put one on my KTM 690. It is L O U D !!!! 50$ is list price from the local HD dealer. Comes with a mounting bracket and some nuts/screws. Has a two wire hookup just like the C14. Caught the receptionist off guard when I told him I was there to buy a HD horn for a Kawasaki! You wouldn't by chance have the part # would ya? Reason I ask is they (HD) sell a "loud horn kit" for the Sportster and i'm wondering if it's the same horn. The loud horn they list is #69000007. But I thought loud pipes saved lives. Is it a one or 2 horn package? Maybe that's why, besides it just being HD, it's $20 more? The '16 sportster only has one horn. I"m using Fiamm Freeway Blasters. I mounted them between the fork tubes utilizing the old front brake hose splitter mount. They aim forward and down at the base of the fairing. I left the stock horns in place, hooked up. The Fiamms get power from from an aux circuit feed using a relay activated by the stock horns. When I turn the key on, only the stockers sound off. I have to have hit the starter button for the aux panel to work. I do have to pretty much remove them to change out the headlight bulb which hopefully now with an LED in place will be a while. I have a set of the FIAMM Freeway blasters on my Z1000, which I like, but I'm Considering Hella Supertones or Sharptones for the Concours, since I think they'll fit in the stock spot with only a little modification.. I would estimate 20-25% louder than stock and with a much reduced cartoonish "meep-meep". Cheap ($9 bucks) and easily installed in the stock location. Thanks NYbiomed, that sounds like a winner! I put a Fiaam Freeway Blaster low tone on my Versys, seems pretty loud. Louder than the meep-meep that came with it. The Concours has a Stebel air horn with Murph's horn wiring kit mounted with a custom bracket under the right side panel. Loud enough without the fairing throwing the sound back at me. Bright colors save lives. They hit the fork brace on hard braking. May need to regroup. Late on this but have been busy wearing out me KLR in the Colo wilderness. I have the Freeway blasters mounted at where the brake splitter usta be, as mentioned above. What I did not mention is that I used the included mounting straps to raise the horns up into the fairing. No fender issues but a real treat trying to change headlight bulb. I find it easiest to remove the horns before trying to change that bulb. Went to Evitek LED, so hopefully no longer an issue. I'm using a Stebel Nautilus and it is LOUD!!!!!! Their website claims 139db and I'm guessing that's pretty accurate. I had a woman try to come into my lane on the hightway. I was next to her and she had her window down. I hit the horn and she just about jumped out of her skin. The only place I could get it mounted on my C10 was next to the battery box. The horn is so loud, I don't think it really matters where it's mounted. One advantage to where it's at is it's under the side panel to it's protected from rain. One thing kinda cluggie is the wiring harness (sold separately) comes with a 10amp fuse. Myself and others who have this horn have complained it consistently blows the fuse. The standard fix seems to be put in a 15amp fuse. I did and hasn't blow since and no melted wires or burned out relay. So other than that, I highly recommend this horn. How did you get the Stebel mounted? It fits in the spot OK but I couldn't come up with a way to mount it turned down like the directions without welding a tab. I mounted mine under the right side panel. 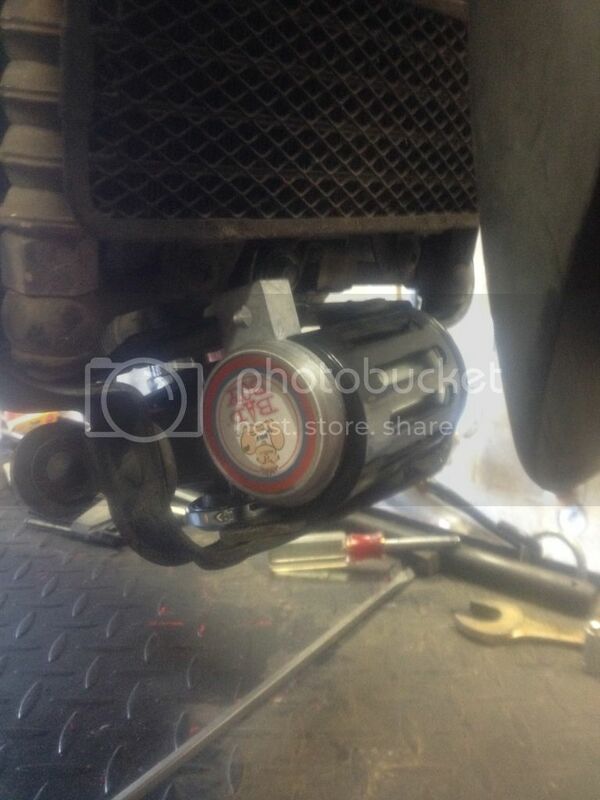 Be creative, Use the tab on the rear fender and drill a hole in the battery box using a round head bolt to mount. I think you could toss the Stebel into your Givi tail trunk and it would still get cager's attention. Get Murph's horn wiring kit too. I mounted my stebel like this. On my C10, I had mounted a Wolo Bad Boy. I split the compressor from the trumpets. I mounted the trumpets using the old brake manifold that is above the radiator, and mounted the compressor on the right side of the fairing. The installation wasn't pretty, but it held for years, and even my "event" last fall. This may be the best option. It may be possible to mount the trumpets where the stock horn is located, and then mount the compressor in the right side of the fairing, nicely tucked out of sight.